Conventional supermarkets and Walmart are far and away the top outlets where consumers regularly shop for groceries, according to the TABS Analytics 6th Annual Food and Beverage Consumables Study. Of 1,000 U.S. adults surveyed, 75% cited traditional grocery stores and 57% named Walmart as the retail venues they regularly visit (more than six times per month) to buy food and beverages. “A quest for convenience seems to have tempered consumers from bouncing from outlet to outlet, leaving traditional grocery stores and Walmart as the top places they shop regularly,” TABS said in the report. 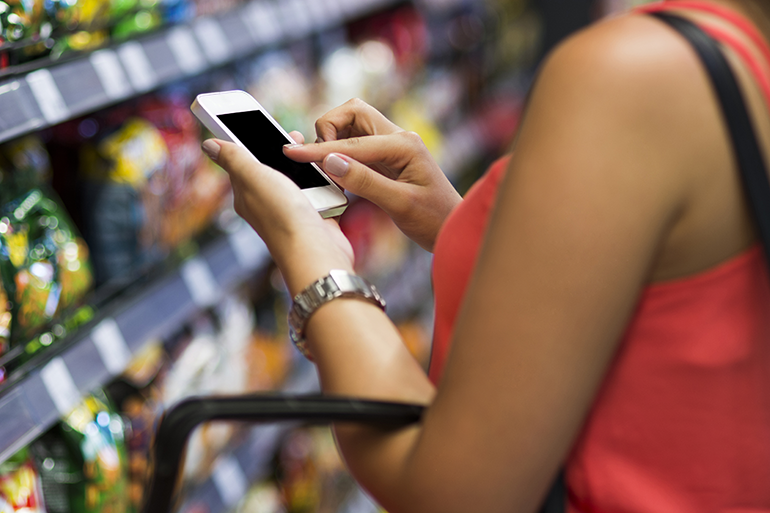 Food and beverage shoppers’ focus on convenience, however, has steered more of their trips to small-format stores. Compared with last year’s survey, 2% fewer consumers named supermarkets and Walmart outlets where they shop regularly for groceries, while 2% to 4% more customers cited dollar stores, drug chains like CVS and Rite Aid, and value food banners like Aldi. Also seeing gains were Target, Trader Joe’s and Whole Foods Market. Indeed, online was cited by just 17% of respondents — or one in six consumers — as a regular grocery shopping outlet (six or more purchases per year). Although that marked a 4% increase from last year’s survey, TABS pointed out that only 38% of consumers said they’ve made food and beverage purchases online even once and, conversely, 62% still buy no food or beverages online. Brick-and-mortar grocery accounts for 95% of transactions, and 99% of adults say they buy food and beverages regularly at a brick-and-mortar outlet, TABS reported. Meanwhile, 44% of those polled said they’re loyal online grocery shoppers, up from 38% a year ago. Yet that percentage still represents well under half of consumers, the CPG research firm said in the study. Online grocery customers favor delivery over pickup by more than two to one. Of shoppers making online food and beverage purchases, 10.3% use delivery, 4.4% use click-and-collect and 2% use both. Pickup grew the fastest, up 47% from the 2017 study. Amazon was the top online food and beverage shopping venue, cited by 24% of consumers surveyed. Next were Walmart.com (15%), Target.com (9%), supermarkets (9%), Jet.com (2%), Peapod (2%), FreshDirect (2%) and NetGrocer (1%). However, Amazon dipped 1% versus last year’s study, while Walmart gained 1% and supermarkets increased 2%. Among food and beverage categories, salty snacks ranked No. 1 with a purchase frequency of 8.7 (based on a two-year compound annual growth rate), according to the study. Frozen pizza, novelties and popcorn have seen the strongest gains, which TABS said is driven by a “dual trend” of more buyers and more transactions by “very heavy” buyers, who purchase the products over 11 times per year. Carbonated beverages was the only category experiencing declines, even though the purchase frequency for carbonated beverages (8.4) still exceeds that for water (8.3). In candy, nearly two-thirds of all purchases (by shoppers buying the category more than three times annually) are made at traditional grocers, Walmart, dollar stores and Target, compared to only about half for food and beverages overall. TABS noted that warehouse clubs and small-format stores (except drugstores) have ample room for growth in bagged candy sales — whereas online received less than 1% of mentions as a shopping outlet for bagged candy, much lower than the 5% share it holds for food and beverages overall. TABS’ 2018 study also found that deals remain important to many shoppers, particularly heavy purchasers of food and beverages. Of respondents, 38% use three to five deal tactics, and 24% use six or more. Everyday low pricing is the most preferred deal tactic, cited by 63% of consumers, followed by circulars (45%). Value sizes declined to 33% from 41% last year. TABS said online coupons “are still not gaining traction” despite rising to 33% of shoppers saying they use them. Deal search behavior reported by consumers fell to 41% this year from 46% in the 2017 survey, mainly due to a decline in such behavior from households with children, according to TABS. “The overall decline in the number of places people shop to get a deal will have implications on how retailers make gains in these product categories,” the report said.